It's an awfully vivid way to demonstrate how swiftly time passes and how much each second counts. I've decided that after this semester at DePauw finishes in May, I'm not going to seek or accept prolonged teaching appointments far away. I withdrew my application to teach for Semester at Sea, which would have involved teaching three courses on board a cruise ship sailing to ports in Japan, China, Burma, Vietnam, India, Ghana, South Africa, and Morocco. I still have a commitment to teach for six weeks in the summer graduate program in children's literature at Hollins University in Roanoke in the summer of 2017. But except for that, my plans now are to stay closer to home. I feel a little bit like Professor Harold Hill at the end of The Music Man, the traveling conman who decides not to flee River City after he falls in love with librarian Marian. "Well, for the first time in my life," he says, "I got my foot caught in the door." Having a little grandbaby here in Boulder, and another on the way in May, I've gotten my foot caught in the door. While I'm certainly going to keep a valid passport close at hand, escape no longer beckons with the same allure. I've never been the kind of person who believed that family was everything. Indeed I wrote a post on this blog a few years ago that staunchly maintained the opposite, and I still stand by every word of it. I'm not someone who thinks that on my deathbed all I'll care about is the time I spent with my family. On my deathbed I'm going to be proud of the books I've written and the students I've taught. 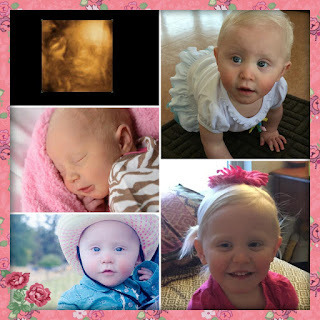 I have loved being a writer as much as I've loved being a mother, and now a grandmother. There, I've said it again. But here's the thing. Lately I haven't been much of a writer. With all the work to prepare the three courses I'm teaching this spring, two of which I've never taught before, and now teaching those same three courses, five days a week, I've crowded writing out of my life. The person who gives inspirational talks on how she writes all her books in just an hour a day while working hard at another full-time job isn't writing much at all. I've chosen to focus on what's urgent now - getting ready to walk into the classroom prepared for class tomorrow - over what's more important to me in the long run: writing books. I love teaching, I do; but I love writing more. So in choosing home over faraway adventures, I'm not just choosing time with a sweet, stubborn, funny, naughty, adorable little grandchild over a full and flourishing career. I'm choosing both the people I most want to be with and the work I most want to do. I'll still have a heart that seeks and needs and loves both work and family. But for the foreseeable future, at least, I want to love both of them here, in this one place. I recently had a book proposal rejected by the publisher with whom I've worked closely and lovingly for some twenty years. The proposal was for a new chapter book series, with four books outlined, which means that technically, it's four rejections in one. I've had rejections before, of course. Every author has. But this one scared me more than usual. This time I don't have that steady paycheck from the University of Colorado Philosophy Department; instead I have a small monthly stipend from the early retirement package I accepted. At this moment, I have my DePauw University salary, but my past gigs here were as a distinguished visiting professor; given that it was well past time for someone else to have a turn at that opportunity, I'm here this semester as a paid-per-course adjunct. And after this, I ain't got nothing. Worse, right now I don't have any wonderful next idea to submit. Indeed, the reason why the recent proposal was (rightly, in my view) turned down is that even it wasn't all that terrific. So I'm a teensy-weensy bit terrified about: 1) money; 2) my career; and 3) the rest of my life. Then I went to church this morning, to Gobin Memorial United Methodist Church here on the DePauw campus in Greencastle. It's the first Sunday in Lent, the forty-day period of penitence and introspection leading up to Jesus's death and resurrection. I took one look at the church bulletin, and I knew that in some strange way everything was going to be all right. The service was titled "Gifts of the Dark Wood." There's a path, though it winds its way through darkness. We would choose to avoid it if we could. We awake to an unexpected calling. God says, 'Come, there are gifts in the Dark Wood.'" I love having a name, and such a beautiful one, for this groping, lost time in my career/life. I'm in the Dark Wood. But there are gifts in that wood, gifts for all of us, gifts for me. Later in the service we heard the story from the Gospel of Mark when the hemorrhaging woman, failed by all other healers, touches the hem of Jesus' garment, and the bleeding halts. We were asked to write down what it is that we need to be healed from, in this Lenten season, then to tear up the paper and place the scraps in a basket by the altar, taking with us one strip of fabric to remind us that we, too, can reach out and touch the robe of Jesus. I won't say exactly what I wrote on my piece of paper: that's between me and God. But I felt more at ease in the Dark Wood after I surrendered it. Even the Dark Wood can be a beautiful place to wander. I'm back to loving my life in Indiana with a grateful heart. Here is one of the reasons why. 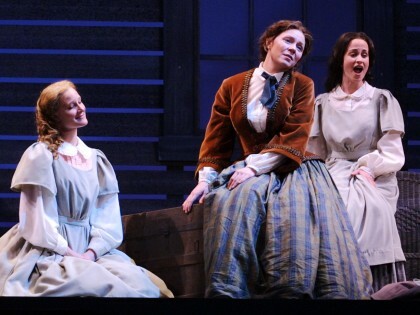 The DePauw University School of Music stages an opera production every year, and this year's selection is the 1998 opera by American composer Mark Adamo, Little Women. At a small liberal arts college like this, it isn't sufficient just to produce an opera. Oh, no. There must be all kinds of opportunities for campus-wide engagement with the piece. Last fall the DePauw film series screened the 1994 film version of Little Women with Winona Ryder as Jo, which I was unable to attend as I was off campus in Boulder that semester. But last week I attended the talk by YA author Michaela MacColl about her fictional depiction of young Louisa May Alcott, The Revelation of Louisa May (hosted by the Putnam County Public Library, to get the larger community involved in all our Alcott enthusiasm). Next week I'm looking forward to a lecture by historian Robert A. Gross on Alcott's life and work situated within the history of her hometown, Concord, Massachusetts. As I savored the campus's Little Women festival featuring the opera of Little Women, film of Little Women, recent historical fiction making use of Little Women, and scholarly lecture on Little Women, I asked myself, "Hmm. What is missing here?" Yes: reading the actual book of Little Women! So I organized a reading group sponsored by the Prindle Institute for Ethics. The reading groups meet in the evening by the beautiful fireplace in the Prindle's Great Hall; the Prindle purchases the books for all the participants as well as wine and an array of lovely snacks. Our group, composed of faculty from Philosophy, French, History, English, and Classics, as well as staff from admissions, the university science library, and other campus units, met for the first time last week to discuss the first half of the text. Some had never read Little Women; others hadn't read it since childhood; some were reading it yet again as a beloved oft-visited friend. I did force everybody to postpone the topic we wanted to talk about most: should Jo have married Laurie?! That will be the centerpiece of next week's meeting on the final half of the book. I chose for us the Norton Critical Edition of the text, so our third meeting will focus on selected scholarly and critical essays included there. Our final meeting with involve a Skype visit with one of the Norton Critical Edition's editors, the brilliant and generous Anne Phillips of Kansas State University. In between the second and third meetings, we'll have time to go together to see the campus production of the opera. But here's the best part. Two of the students in my seven-person Honor Scholar course on "The Ethics of Story" are School of Music voice students, and both have roles in the opera: one as Laurie, one as Mr. March. This week the composer himself is here on campus doing intensive coaching of the students in their roles. "Laurie" invited me to come sit on his coaching session. He sang the role so beautifully and became Laurie so completely before my eyes that I was sure Mark Adamo would find no suggestions at all for improvement, but of course Mr. Adamo had suggestions on every syllable. It was fascinating to see such attention to the details of each breath, phrasing, and gesture. Now "Laurie" and his real-life girlfriend who is playing Jo (!!!) are going to join us at the third meeting of the Little Women reading group to talk about their interpretative choices as they developed their roles. This feels to me like everything a liberal arts education should be and offers to me every pleasure a professor at a liberal arts college could possibly dream of experiencing. The first week of the new semester is done, and all three classes look delightful. I can truly tell by the first day, the second at the latest, how good a class is going to be. Good classes have students who are willing to talk, but none who feel the need to hear themselves talk all the time. Extra bonus: students who nod and smile as I talk. Biggest bonus of all: a sprinkling of beloved students I've taught before. The content of my children's literature class is now dear and familiar to me from teaching it several times before. Yesterday we argued amicably over Maria Edgeworth's early 19th-century story, "The Purple Jar." Some students were furious at little Rosamond's sanctimonious parents who allow her to purchase a beautiful purple jar (which only appears to look purple because of nasty purple chemicals inside) rather than much-needed shoes; other students were annoyed at clueless Rosamond herself. In my ethics of immigration class, we're trying to get a first look at empirical findings on immigration. Some that have surprised us: levels of global immigration have remained constant over the past fifty years (with immigrants making up around 2-3 percent of the world's population); immigrants tend not to be the poorest of the world's people (the desperately poor don't have the resources to migrate); governmental efforts to reduce the flow of immigration tend not only to drive immigration into irregular and unregulated channels. My eight-person "Ethics of Story" class practically teaches itself, as the students come to class so well prepared to talk, talk, talk. We launched the course with Jonathan Gottschall's engaging little book The Storytelling Animal, focusing most of our attention on his discussion of why we might have evolved as storytelling creatures. Students with more background in evolutionary biology found his treatment of the subject on the "lite" side, but all found the topic fascinating: do we seek out stories as the evolutionary strategy of obtaining cost-free preparation for surviving future traumas in our own lives? So the first week was wonderful. And yet I'm still so homesick, in a way that I can't seem to shake, despite dinners with friends, a "Janeites" book club meeting (Americanah, by Chimamanda Ngozi Adichie - fabulous, read it! ), a philosophy department discussion of Whistling Vivaldi: How Stereotypes Affect Us and What We Can Do by Claude M. Steele (reads like a detective story, with lots of useful advice for educators), and many other treats. I just miss home. I just do. I debated whether I should cross down the days till I head back to Boulder for good in May. In favor of the countdown; the pleasure I always get in crossing anything off a to-do list. Against the countdown: the dismal thought that I'm counting my life away. I decided to make the countdown list. But I made it with a twist. I wrote down all the days until I go home on May 20; I started the list on the day before I left for Europe (134 days left); I'm now down to day 105. Instead of crossing the days off, however, for each day I record a blessing, or two or three: something lovely, something joyous, large or small. Of course that was staggeringly easy to do in London and Paris, but it's turning out to be staggeringly easy to do in Greencastle, Indiana, too. Reading A Nearer Moon (magical!) by my friend Melanie Crowder. A chilly, sunny February walk with two philosophy department colleagues. A take-your-breath away lunchtime talk by an art historian colleague. Reviewing galleys for my new middle-grade novel with a young, witty editor who shares my passion for grammatical minutia. I'm not counting my life away; I'm amassing a list of blessings, with, after today, 104 more days of blessings to come.